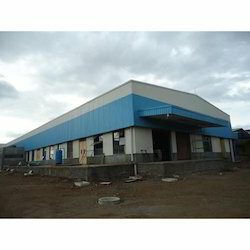 We are a leading Manufacturer of prefabricated factory shed from Pune, India. Since our commencement, we are engaged in manufacturing and supplying Prefabricated Factory Shed. Under the supervision of our skilled professionals, these engineered factory sheds are manufactured without making any sort of compromise with the quality of the products. In order to deliver flawless range of engineered factory sheds to our customers, we have appointed a team of quality. Looking for Prefabricated Factory Shed ?